The three principal competing fighters of the Battle of Britain; the Supermarine Spitfire, Hawker Hurricane and Messerschmitt Bf 109, are well known. However, there is still some misunderstanding of the relative performance of the armament they used and the effect of this on the Battle. This article is an attempt to set the record straight. The British armament was quite straightforward; both aircraft had eight belt-fed .303" (7.7mm) Browning guns mounted four in each wing outside the propeller disk. Rate of fire was 20 rounds per second per gun (160 rps overall) and the cartridge fired ball, AP, tracer or incendiary bullets weighing around 11.3 grams at around 740 m/s (2,430 fps). Total weight of projectiles fired was 1.8 kg (4 lb) per second. Ammunition capacity was enough for 16 seconds continuous firing in the Spitfire, slightly more in the Hurricane. The Messerschmitt's armament was mixed, and had been going through various changes. One constant in all 109s (until the later G series) was the twin MG 17s in the cowling, synchronised to fire through the propeller disk – this held their rate of fire down to about 17 rps each. The 7.9mm cartridge was slightly more powerful than the .303's although it is difficult to make direct comparisons as the bullet weight and muzzle velocity varied according to loading (and the round was improved early in the war with the even more powerful v-Munition). Magazine capacity was enough for a whole minute's continuous firing (reduced from 1,000 to 500 rounds per gun in later versions with engine-mounted cannon). The Bf 109E-1, which was still in service in some numbers at the start of the Battle, also had two more 7.9mm MG 17s in the wings with 500 rpg, giving 25 seconds' firing. Some were converted to take wing cannon instead. The Bf 109E-3 had two wing-mounted 20mm MG-FF cannon, a modified Oerlikon FF made by Ikaria Werke Berlin. It fired 134 gram projectiles at 600 m/s (1,970 fps), at a rate of about 9 per second. The 60 round drums which fed the cannon ran out after less than seven seconds (and perhaps less than that, as it appears that only 55 rounds were often loaded, presumably in the interests of reliable feeding). Some E-3 were modified to E-4 standard and redesignated. The Bf 109E-4, which entered service in May 1940 and was therefore the latest model used at the time of the BoB, introduced the MG-FFM cannon. This was a version of the MG-FF modified to fire the new, thin-walled high-capacity mine shells (Minengeschoss or M-Geschoss). Although containing far more explosive than the MG-FF's shells, the M-Geschoss was much lighter at 92 g. It was fired at a higher velocity of around 700 m/s (2,300 fps) but even so did not develop enough recoil to operate the MG-FF's mechanism, so the gun had to be altered with a lighter reciprocating weight and weaker recoil spring. Ammunition for the MG-FF and MG-FFM was therefore not interchangeable. It appears that MG-FFs were gradually converted to the FFM standard and the two terms used interchangeably thereafter. Tests by the RAF indicated that both the .303 and 7.92mm AP bullets had some problems penetrating the structure of the relatively small and light Blenheim bomber. Both guns were fired at a range of 200 yards (180m) through the rear fuselage at the 4 mm armour plate protecting the rear gunner, which was angled at 60º to the line of fire. The results were poor; only 33% of the .303" rounds reached the armour (the rest being deflected or absorbed by the structure) and 6% penetrated it. In contrast, only 23% of the 7.92 mm bullets reached the armour, and just 1% penetrated. The incendiary ammunition was also variable in performance. Comparative British tests of British .303" and German 7.92 mm incendiary ammunition against the self-sealing wing tanks in the Blenheim, also fired from 200 yards (180m) astern, revealed that the .303" B. Mk IV incendiary tracer (based on the First World War Buckingham design – it was ignited on firing and burned on its way to the target) and the 7.92 mm were about equal, each setting the tanks alight with about one in ten shots fired. The B. Mk VI 'De Wilde' incendiary (named after the original Belgian inventor but in fact completely redesigned by Major Dixon), which contained 0.5 grams of SR 365 (a composition including barium nitrate which ignited on impact with the target) was twice as effective as these, scoring one in five. The 'De Wilde' bullets were first issued in June 1940 and tested operationally in the air battles over Dunkirk. Their improved effectiveness, coupled with the fact that the flash on impact indicated that the shooting was on target, was much appreciated by the fighter pilots. It was at first in short supply, and the initial RAF fighter loading was three guns loaded with ball, two with AP, two with Mk IV incendiary tracer and one with Mk VI incendiary. The 20mm cannon did not entirely rely on the M-Geschoss. There was still a requirement for some tracer rounds, so lighter 117 g projectiles were developed (by fitting the 134 g HE-T with a light-alloy instead of brass fuze), loaded down to around 585 m/s (1,920 fps) to match the recoil characteristics of the M-Geschoss. The effectiveness of the M-Geschoss was somewhat reduced by the fast-acting fuze, which detonated instantly rather than inside the target's structure, although this was probably more of a problem against bombers than fighters. The British rated the M-Geschoss as about equal with the 20mm Hispano round, which contained much less HE but had a heavier shell fired at a higher velocity and could penetrate more deeply. Delayed-action fuzes for the German shells were introduced in 1941. AP shells were also developed later and were not available during the Battle of Britain. Comparisons of the effectiveness of the British and German armament are not unlike the comparisons of the aircraft – each had its strengths and weaknesses. The British armament had a very high rate of fire (160 v. 50 rounds per second for the Bf 109), increasing the chance of scoring a hit. In weight of fire the German guns had a slight advantage (2.0 v. 1.8 kg per second), whereas in total muzzle energy there was nothing to choose between them. The key difference was of course the high explosive in the 20mm shells, which was enough to give the Bf 109E-4 almost double the destructive power of the British fighters. The M-Geschoss were not good at penetrating armour but this was considered a reasonable price to pay for the increased HE blast effect. The Luftwaffe discovered that the most reliable way of bringing down aircraft was the general destructive effect of HE blast within the structure, rather than relying on being able to hit vital but small areas (e.g. the pilot! ), which could be, and quickly were, protected by armour. For this reason, AP projectiles eventually disappeared from German cannon ammunition belts except for special purposes. Two other considerations were the location of the armament and the ballistics. Wing mounting had the disadvantage that the guns could all be harmonised to strike the same point at only one distance (the RAF initially selected 360 metres but reduced this to 225 metres in the light of battle experience). At shorter or longer distances, the fire was more dispersed (particularly from the Spitfire, whose guns were spread across the wing). In fact, at very short distances a good shot, firing at a Bf 109 at zero deflection, could conceivably miss altogether, the two clusters of bullets passing to either side of the slim fuselage and just above the wings (although they might clip the propeller tips!). The Bf 109's cowling mounted MG 17s did not suffer from this problem (although the wing-mounted cannon obviously did), but the German planes had a difficulty of their own in that the trajectories and times of flight of the MG and cannon projectiles were different, requiring some compromise in adjusting the guns and setting the sights. The low-velocity cannon were particularly difficult to hit with at long range, because of their curved trajectory and long flight time. To sum up, the British armament was highly effective against unarmoured fighters and the high firing rate improved the chances of hitting. At the start of the war it was probably the best armament available against fighters. However, the rapid introduction of armour protection during 1940 greatly reduced the effectiveness of all rifle-calibre machine guns and gave the cannon a clear advantage, especially against bombers which were easier to hit but more difficult to destroy. Many German bombers made it back to base despite being riddled by up to 200 .303 bullets, protected by crew seat armour and self-sealing fuel tanks. This compensated to some extent for their poor defensive armament, which consisted of hand-aimed 7.92mm MG 15 guns in single mountings. While Galland might have expressed a preference (seriously or not) for Spitfires, the RAF could certainly have done with some cannon to help them destroy the German bombers. The Hispano was coming, but was just too late. Well before WW2, the RAF realised that the increasing speeds and toughness of aircraft would call for something more powerful than the .303 MG. Extensive tests in the 1920s of Browning and Vickers .50 calibre HMGs and of the Oerlikon Type S 20mm cannon had provided important information about effectiveness. At that time, a battery of .303s was chosen as the best option (contemporary aircraft being lightly built and unarmoured), but by the mid-1930s it was recognised that a bigger gun was needed. The .50 HMGs were rejected as "neither fish nor fowl" as they were much heavier and slower firing than the .303s, but did not have the benefit of an effective HE shell, and the RAF decided to look for a 20mm cannon. In 1936 RAF staff witnessed a demonstration of the prototype of the French Hispano-Suiza HS.404 in Paris, and thereafter entirely focused their attention on this weapon. Much effort was made to get the Hispano cannon into service. 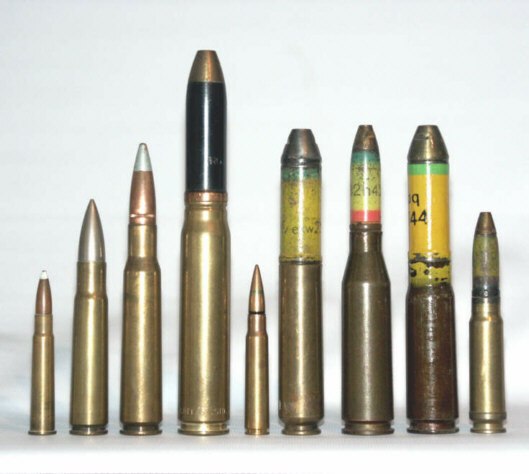 An ACAS report in November 1938 stated that "recent firing trials against armoured and unarmoured aeroplanes have convinced me that a more powerful weapon than the .303 must be introduced into service as soon as possible; this factor is so important that the policy for development and production must be laid down at once....The 20mm calibre is the minimum which can be accepted....The Hispano gun should be regarded as the immediate step forward...every effort should be made to ensure rapid production." Interest was also expressed in developing a gun of at least 37mm calibre in the longer term, capable of bringing down an aircraft with one hit. Despite the high priority given to the Hispano, the problems associated with acquiring manufacturing rights, redesigning the gun to imperial rather than metric measurements, setting up a factory and debugging the weapons, delayed the Hispano's general introduction into service until after the Battle was over. However, one squadron (No.19) of Spitfire Mk 1B fighters, each armed with two Hispanos, was thrown into battle in June 1940. The results were disastrous; the gun did not respond well either to being mounted on its side (done to bury the top-mounted drum magazine within the thin wing) or to being installed in a flexible wing instead of to the rigid engine block it was designed for. Reliability was so poor that the squadron asked for its .303-armed Spitfires back. Later on, the Hispano would be fully debugged and became arguably the best fighter gun of the war, but it was too late when it was needed most!